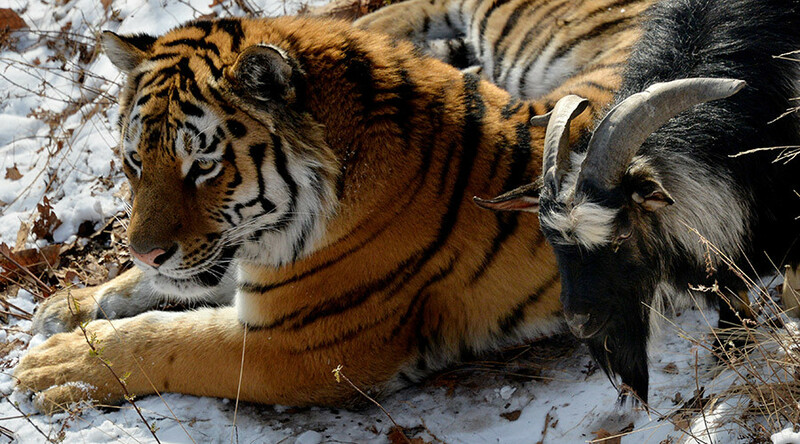 A rare friendship between Amur and Timur, a Siberian tiger and a goat, has raised many eyebrows after the dare-devil goat refused to be the predator's lunch, and commandeered the feline’s bed instead. Fans are calling on the zookeepers to resettle the goat, saying its life is worth saving. “Please, house the goat separately and let it live in your safari park. Let his story be not only about the compassion the tiger showed towards the brave goat, but about people showing humanism too,” one activist, Bogdan, wrote on the website of the Far Eastern Safari Park in the Primorsky region. “Their friendship is highly unusual and phenomenal. Park staff, director, have you got a mite of compassion towards Timur? Can it be placed separately? The goat is sensational! Save it!” Mikhail, another enthusiast, added. "Resettle Timur, he has earned the right to live, please!" Marina wrote. The moment staff at the Russian safari park put the goat inside the big cat's enclosure earlier this week, they said goodbye to Timur (who didn't even have a name back then), presuming it would meet a gruesome end as with other animals in the past. Amur is used to killing and eating goats and rabbits twice a week. However, Timur proved to be a hard nut to crack after it forced Amur out of its bed, forcing the tiger to sleep on the roof of his cave for several nights. “Nobody taught the goat to be afraid of the tiger. So, Amur decided not to mess with the fearless goat, and didn't eat it,” the zookeepers wrote on the park's website. “During the day, Amur and Timur walk together like a pair of good friends. Timur takes Amur for an alpha male, and follows it everywhere. Timur's fearlessness and caution have led to such a paradoxical result,” they said. The goat is being fed every day: it gets hay, wheat, feedstuff and water. On Thursday, Amur caught the zookeepers totally unawares when it came to the canteen, ate its meat and then waited patiently for its new friend. “It even hissed at an employee who feeds the tigers, as if to tell him, 'Hey, don't you ever approach my friend.' Before that, he never showed any aggression towards staff,” the zookeepers noted.